The story of history's most famous mermaid, that fascinated audiences in the nineteenth century. 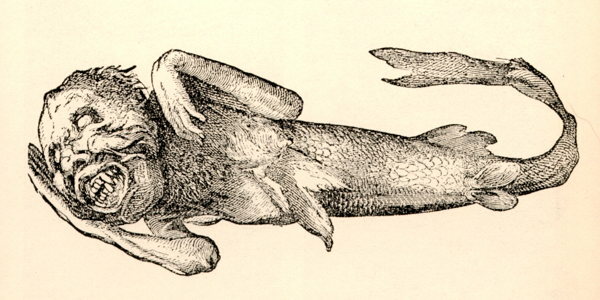 In July 1842, an English gentleman named Dr. J. Griffin, said to be a member of the British Lyceum of Natural History, arrived in New York City bearing a remarkable curiosity: a mermaid supposedly caught near the Feejee Islands in the South Pacific. The press were expecting him, since throughout the Summer they had been receiving letters from Southern correspondents describing the doctor and his mermaid. So when he checked into his hotel, reporters were waiting for him, demanding to see the mermaid. Grudgingly he obliged. What they saw totally convinced them of the creature's authenticity. Soon after this, the showman P.T. 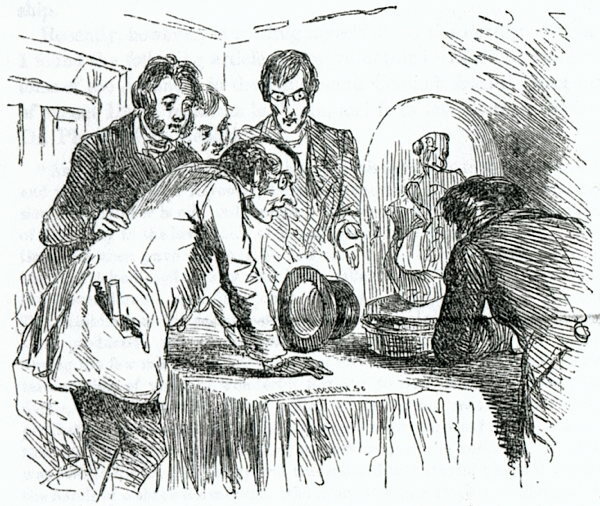 Barnum visited the offices of the major papers where he explained that he had been trying to convince Dr. Griffin to display the mermaid at his museum. Unfortunately, the doctor was unwilling to do so. 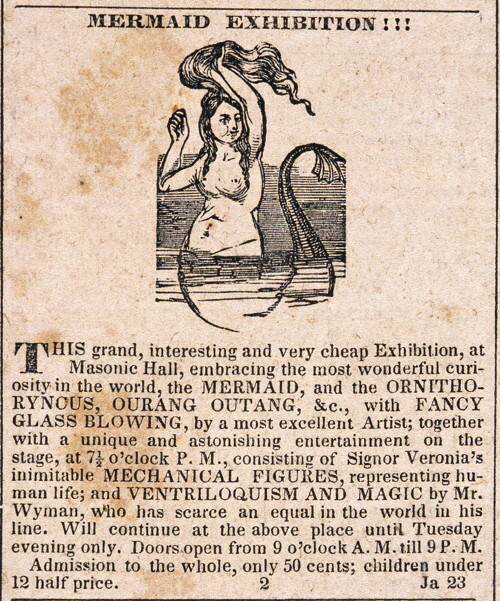 So Barnum volunteered to give the papers use of a woodcut of a beautiful, bare-breasted mermaid that he had prepared, since it was now useless to him. The papers (each thinking they had an exclusive) happily accepted the offer, and on Sunday, July 17, mermaid woodcuts appeared in all the papers. Simultaneously, Barnum distributed ten thousand copies of a pamphlet about mermaids throughout the city. 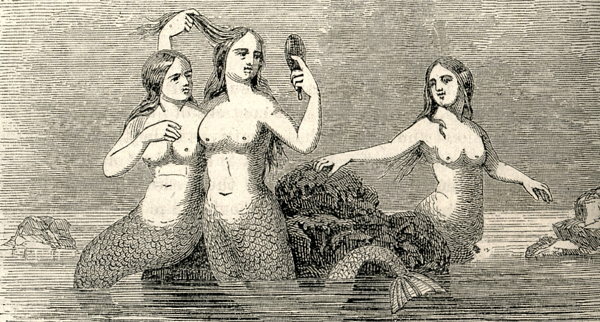 The mermaids in the pamphlet were also represented as seductive ocean maidens. With all this publicity, anticipation to see the Feejee Mermaid (as it was now being called) became enormous. (Note: it's also often spelled Fiji or Fejee.) It was the main topic of conversation throughout the city. Everyone was talking about whether it was a real mermaid. They had to see it for themselves. So Dr. Griffin agreed to exhibit it for a week at Concert Hall on Broadway. "We've seen it! What? Why that Mermaid! The mischief you have! Where? What is it? It's twin sister to the deucedest looking thing imaginable—half fish, half flesh; and 'taken by and large,' the most odd of all oddities earth or sea has ever produced." After the week-long engagement at Concert Hall, Dr. Griffin agreed to allow the mermaid to stay longer in New York City. So it was moved to Barnum's American Museum, where it was exhibited for a month "without extra charge." Ticket receipts at the museum promptly tripled. Throughout all this, the deception of the public had been three-fold. First, although advertisements had shown the mermaid to have the body of a young, beautiful woman, the creature itself was far less attractive. It had the withered body of a monkey and the dried tail of a fish. As a correspondent from the Charleston Courier put it: "Of one allusion... the sight of the wonder has forever robbed us — we shall never again discourse, even in poesy, of mermaid beauty, nor woo a mermaid even in our dreams — for the Feejee lady is the very incarnation of ugliness." In his autobiography, Barnum later described the mermaid as "an ugly, dried-up, black-looking, and diminutive specimen... its arms thrown up, giving it the appearance of having died in great agony." Second, Dr. Griffin was a fraud. He was no English gentleman. In fact, there was no such thing as the British Lyceum of Natural History. Griffin's real name was Levi Lyman, and he was Barnum's accomplice-in-deception. The mermaid's introduction and exhibit had been the brainchild of Barnum all along. Barnum had arranged for letters about Dr. Griffin to be sent to New York papers throughout the Summer, and had then carefully orchestrated the mermaid publicity once Dr. Griffin (Lyman) "arrived" in New York. This had all been done to give the mermaid a veneer of scientific respectability. Museum-goers examine the Feejee Mermaid. Illustration from Barnum's Autobiography. Finally, the mermaid itself was a fake, and Barnum knew it. He had leased the mermaid from Boston showman Moses Kimball (who, in turn, had bought it from a seaman), but before doing so Barnum had consulted a naturalist to inquire about the mermaid's authenticity. The naturalist had assured him it was quite fake. Nevertheless, Barnum realized that it wasn't important whether or not the mermaid was real. All that was important was that the public be led to believe that it might be real. So he hired a phony naturalist (Dr. Griffin) to vouch for the creature's authenticity, placed pictures of bare-breasted mermaids in the newspapers, and thereby manipulated the public into wanting to see it. As Barnum's biographer A.H. Saxon puts it, the Feejee Mermaid was a classic example of Barnum's ability to "take a mildly interesting object that had been around for some time and to puff it almost overnight into an earthshaking 'event.'" Where Did the Feejee Mermaid Come From? Barnum himself didn't create the Feejee Mermaid. As noted, he merely leased it from Moses Kimball. In fact, the creature had already enjoyed quite a colorful history before Barnum transformed it into a celebrity. By September, 1822 Eades had made it back to London with the mermaid, and it did prove to be a popular attraction. But it never made a fortune for him. Eades wasn't as good a showman as Barnum would later be. In addition, British naturalists who had a chance to examine the mermaid soon debunked it in the press, dampening the public's interest in it. Then Eades was sued by the other owner of the ship. The courts ordered Eades to pay back the money he had embezzled by serving the shipowner without pay until he repaid his debt. Eades sailed the seas for the next twenty years, trying to repay the debt. But he never did. When he died, ownership of the mermaid passed to his son, who promptly sold it to Moses Kimball for a fraction of what his father had bought it for. After Barnum had exhibited the mermaid for a month at his Museum, he decided to send it on a tour of the Southern states. He entrusted his uncle, Alanson Taylor, with this responsibility. Barnum anticipated an uneventful tour, but this was not to be. When Taylor and the mermaid arrived in South Carolina, they found themselves embroiled in a bitter feud between two rival newspapers, the Charleston Courier and the Charleston Mercury, with the mermaid as the focus of the dispute. The problem began when Richard Yeadon, editor of the Courier, wrote a review of the mermaid in which he declared his belief that she was real. Simultaneously, a local amateur naturalist, the Rev. John Bachman, published a review in the Mercury in which he blasted the mermaid as a crude humbug created by "our Yankee neighbors." This difference of opinion quickly escalated into a bitter argument. (So bitter that, if not for the intervention of "mutual friends," it might have ended in a duel.) This dispute brought an early end to the Southern tour, and the Feejee Mermaid had to be secretly shipped back to New York. For the next twenty years the Feejee Mermaid split her time between Kimball's museum in Boston and Barnum's museum in New York. Her biggest adventure occurred in 1859, when Barnum took her with him on a tour of London. When Barnum returned from London in June, 1859, he brought her back to Kimball's museum. This would prove to be the last place we know that she was. After this, her whereabouts are unknown. According to one theory, she was destroyed when Barnum's museum burned down in 1865. But this is unlikely, since she should have been at Kimball's Boston museum at that time. More likely, she perished when Kimball's museum burned down in the early 1880s. Harvard's Peabody Museum of Archaeology and Ethnology does possess a mermaid that some have speculated might be the original Feejee Mermaid. According to their records, this mermaid was saved from the fire that consumed Kimball's museum and was later donated to Harvard by Kimball's heirs. The problem is that the Peabody's mermaid doesn't look anything like what we would expect the Feejee Mermaid to look like. It's much smaller and far less skillfully crafted. So the real Feejee Mermaid probably met her end in the 1880s. But although the Feejee Mermaid is gone, her memory lives on in popular culture. 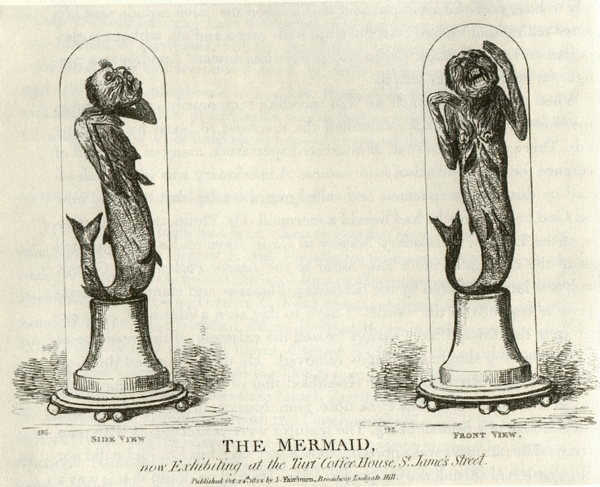 "Feejee Mermaid" has become the generic term for the many fake mermaids that can be found around the world in sideshows, behind bars, or at the back of curiosity shops. (For San Diego residents, one can be seen up in Leucadia.) The Feejee Mermaid herself also made an appearance in an episode of the X-Files ("Humbug," Season 2, Episode 20). My dream come true... Yikes! Barnum, P.T. The Life of P.T. Barnum Written By Himself. Redfield. 1855. Bondeson, Jan. The Feejee Mermaid and Other Essays in Natural and Unnatural History. Cornell University Press. 1999. I was watching the X-Files episode humbug which when I looked up the feejee mermaid I came across this ad I must say it was a nice read. 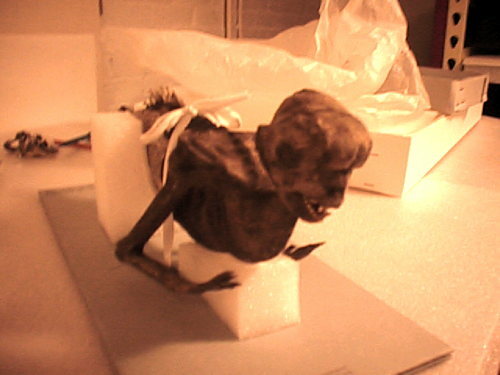 The only thing I really would have like to see is a better photo of the current feejee mermaid. innovation~guys pull up a hoax 2 make money!